Home Features It’s Over. Now It’s Time to Move On. It’s Over. Now It’s Time to Move On. Trips to the Northeast should just be banned for Chelsea. One week after Sunderland fought hard for a 0-0 and had a chance to win, Newcastle United ended Chelsea’s unblemished record this season and handed the Blues their first defeat since facing Atletico Madrid in the second leg of the Champions League semifinal on April 30 with a 2-1 win. Two goals from substitute Papiss Cisse provided the firepower, as Newcastle recorded their third successive win over Chelsea at St. James Park. However, it didn’t always look like it would be the case in this match. For much of the first half, the Blues pinned the home side back into their own half, possessing the ball well and forcing Newcastle to play on the break. Willian had a few shots on target from dangerous positions and Oscar reminded us all that he is Brazilian by flashing a bicycle kick just wide of the post. 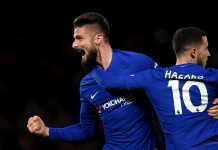 Despite playing a counterattacking game, Newcastle still found it hard to relieve the Chelsea pressure, but when they did, they nearly took a lead. Half an hour in, Sammy Ameobi was finally able to find space on the left and play in Ayoze Perez at the top of the 18-yard box.. The Spaniard was able to play a little reverse ball that freed Jack Colback, but Thibault Courtois produced a good save with his feet. The warning signs were there for the Blues, and supporter’s hopes were buoyed by the appearance of backup goalkeeper Jak Alnwick to start the second half after Rob Elliot suffered a muscle pull after kicking a ball in the first half. After Chelsea continued to probe and Gary Cahill and John Obi Mikel flashed headers off target from set pieces, Alan Pardew decided to make his second change of the match. Papiss Cisse was summoned from the bench for the ineffective Remy Cabella, leaving Newcastle to play two up front. The substitute made his presence felt almost instantly, converting Sammy Ameobi’s deflected cross for the game’s opening goal. Branislav Ivanovic failed to defend the initial cross, and Gary Cahill’s mistimed block placed the ball right in the path of the Senegalese hitman, and Cisse poked the ball past a sprawling Courtois. Jose Mourinho wasted little time in responding to the goal, sending on the trio of Andre Schurrle, Filipe Luis, and Didier Drogba in an effort to create more cross down the left and play a more direct game. Wave after wave of Chelsea’s attacks were thwarted by the excellent Newcastle defence, and Chelsea were unlucky to not have an equaliser on 77 minutes when Ivanovic found Eden Hazard unmarked at top of the box, and Hazard’s shot rattled the left-hand post of Alnwick. The Blues were left to rue that misfortune, as just seconds later on another counterattack, Jack Colback was able to release Moussa Sissoko who prodded the ball across the box just ahead of Courtois, and Cisse once again was on hand to deliver the finish. With Newcastle now looking dangerous on every counterattack and with the Blues committing more men forward in search of an opener, a third Newcastle goal looked much more likely. But more twists and turns were left in the saga. Steven Taylor’s late challenge on Schurrle saw him sent off for a second yellow, and against 10 men, Chelsea finally scored. It was the big man, Drogba, who provided the inspiration rising to head a Cesc Fabregas free kick past Alnwick and giving the Blues renewed hope. Chelsea continued to attack and attack, pinning Newcastle back in their own half for the last 10 minutes. 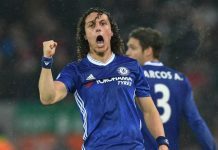 Filipe Luis drilled a swerving shot from 30 yards that forced a good save from Alnwick, Diego Costa had a shot tipped over the bar, and Cahill, Terry, and Ivanovic all had headers from a succession of corners fired wide of the goal. But on this day, it just wasn’t meant to be, and Chelsea head back to London with their first defeat of the season.